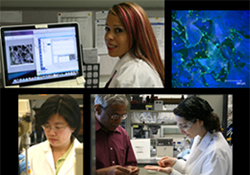 The New Jersey Center for Biomaterials at Rutgers University offers an informal career development pathway for outstanding young scientists who are interested in tenure-track academic positions, but require more training in leading science teams, proposal writing, developing leadership skills, and in authoring high-impact publications. This position allows scientists to obtain independent research support and to lead a research group. It has helped researchers become tenure-track faculty at highly-ranked universities in the US, Latin America, Asia, Europe and Africa. The New Jersey Center for Biomaterials maintains academic laboratories focused on translational research and the commercialization of academic research ideas. We are active across the entire spectrum of product development from basic research in the areas of biomaterials science and tissue engineering all the way to polymer scale-up, prototype development, preparation for GMP manufacturing, and development of regulatory submissions to the FDA. Preferred candidates will have good communication skills in English, have earned a degree from an accredited university, and will have a strong track record of authoring scientific publications.